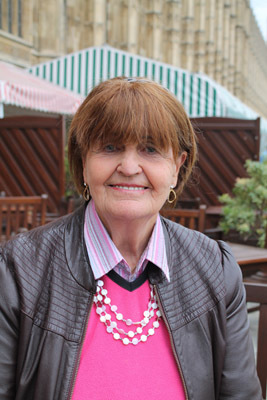 Baroness Cox’s humanitarian aid work has taken her on many missions to conflict zones, allowing her to obtain first-hand evidence of the human rights violations and humanitarian needs. Areas travelled include the Armenian enclave of Nagorno Karabakh; Sudan; Nigeria; Uganda; the Karen; Karenni; Shan and Chin peoples in the jungles of Burma; and communities suffering from conflict in Indonesia. She has also visited North Korea helping to promote Parliamentary initiatives and medical programmes. Additionally, Caroline has been instrumental in helping to change the former Soviet Union policies for orphaned and abandoned children from institutional to foster family care. I think it’s another phrase that I find very helpful and that is the “sacrament of the present moment”. All we ever have is the present moment. There’s no point in living with regrets or nostalgia for the past. That’s been. And God can I hope forgive what was wrong and bless what may have been good. There’s no point in worrying about the future. Take no thought for the ‘morrow, except for those decisions you have to take at critical times but for most of the time just be in the present moment and live in that present moment to the full, give it your all and give it to God. God can bless this present moment and then use your ability which you’ve made available for him and then he will show you where it is that he wants you to develop your life and sometimes it will mean crossing frontiers of fear. It may not be going to a war zone. It may be going into something you find disturbing and scary but if you feel God’s calling you there then please do cross that frontier of fear and just be available to God.